Greetings from my garden! On this first day of summer, it seems fitting that I picked the last of the peas and then the first of the hot peppers this morning. I’m also finally bidding a long farewell to the other spring crops, including the lettuce which has all bolted and turned bitter in the heat, and a few stray radishes whose roots have split in two with all the rain. It’s a long farewell because I know they all need to be pulled out, but I haven’t done it yet. Another sure sign of summer… someone let a fly come into the house and it is buzzing all around me as I write this letter. Where’s the fly-swatter? And last week, on Thursday, our high temperature was 91 F. It’s been a long time since we had a 90+ degree day in June, I’m guessing. Our hottest month is usually July, and some years, even in July we have no 90 plus degree days. Yesterday I went to a family reunion and had a chance to compare notes on gardens with some of my uncles whose gardens are all in zone 6a, whereas I’m in 5b. One uncle bragged that he’s already picked eleven “good” tomatoes, not those first tomatoes that are often not all that good. I forgot to ask him if he bought his tomato plants or grew them from seed. He also told me that he has a three foot fence all around his garden to keep out the deer, raccoons, and of course, rabbits. One morning he was enjoying breakfast on his patio and saw a rabbit inside the fence, enjoying his breakfast in the garden. My uncle thought I would find it funny that he got out a BB gun and shot the rabbit, but the BB just bounced off the rabbit’s hind end and didn’t faze him at all. So much for all those people who tell me to get a BB gun to solve my rabbit problem. Then I had a chance to take a quick tour of another uncle’s garden. He’s already picking cucumbers and his tomato plants are huge compared to mine and all caged up. Here I thought we were all a family of stakers when it came to tomatoes! I guess staking was just my Dad’s way. This uncle’s squash plants were beautiful, but he was having problems with the squash rotting at the ends before they got big enough to pick. I’m not sure what is causing this but did a little research online and think it could be caused by something as simple as the flowers not being adequately pollinated. I wonder if he's seeing a lot of bees around them? Another uncle tends a big vegetable garden with his son and grandsons and reported they had very poor germination of their sweet corn, so his son gave him permission to buy sweet corn this summer. But they want to be careful who they buy it from because they’ll buy enough to freeze and eat all winter and don’t want it to be full of pesticides. It was interesting, too, that my uncle said his son is very meticulous about their garden, which sounds pretty big, and won’t let any weeds grow in it. Whereas another cousin’s husband laughed and said they just plant their garden in the spring and then later in the summer, see what has survived the weeds and harvest that. I think I fall somewhere in the middle with my approach. I don’t pull the weeds the minute I see them, but I do try to keep them from overtaking the garden, even though sometimes it looks like I’m not trying very hard. Speaking of weeds overtaking the garden, we had more rain this past week, so it is good weed growing weather. This also means that conditions are good for pulling weeds, and lettuce, too. I should end this letter and go out and pull some weeds. P.S. 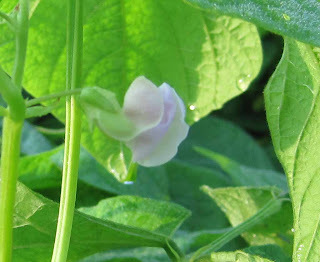 The picture above is a green bean flower. My beans are doing quite well with all the rain and unless something catastrophic happens, I’m expecting a good bean crop this year. P.S.S. Here’s the weekly picture of the garden. I took this one early this morning when I was out there picking peas. See the sunflowers in the lower part of the picture? It won’t be long before they are tall enough to block this view of the garden! 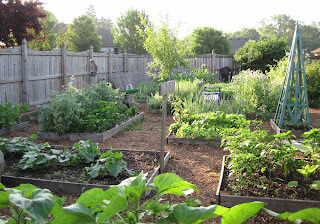 Oh Carol, your veg garden is beautiful. I love the detail on the fence and the tuteur is lovely. Your garden looks terrific. e are battling too much rain too. Wish the sun would stay out! Love your garden. I wish we had too much rain we have hardly had any but the monsoon season is coming next month and I am looking forward to getting some rain. Thanks for sharing love your pictures. I cannot imagine where you weeds are??? Your garden is so lovely and clean!! Neat and productive of such good food. I am like your uncle needing fencing to keep out rabbits... the deer leave me alone till frost... but the rabbits! Well a bb gun at close range does work... I accidently found out... that sounds funny, but never thought a bb would hurt, only sting a rabbit... I wanted them to share but no... they eat all my veggies! I felt terrible about killing the little guy... he went behind a bush and I just shot into it (could not see the rabbit) and walked around and would you believe right in the head... dead. Well they took me more seriously after that... I did not eat rabbit stew, but gave it to the fox. Good luck with your rabbits though from the looks of your garden they do not seem to be doing much damage. I am drooling! Gosh, Carol, your veggie garden is gorgeous. I'm envious! I agree: the problem with the baby squashes rotting is due to not being pollinated. Squashes grow two types of flowers - one male, which is your standard squash flower on a stem - and one female, which is a flower on what looks like a baby squash. If the female flower isn't pollinated, it'll shrivel and die without forming proper fruit. You can hand-pollinate them yourself to make sure, or if you're short on bees. I wrote a post on this a few years ago. Your veggie garden is gorgeous.